Have you ever heard of Wilson Bentley? Perhaps he is better known as the snow flake man. During his life (he was born in 1865 and died in 1931), Bentley studied snowflakes, wrote dozens of articles about snow flakes, and even took thousands of snow flake photos. Bentley was a pioneer in his field, because he blazed the trail on a whole new area of research that, until his studies, was largely uncovered. Bentley did much for snow flake research. 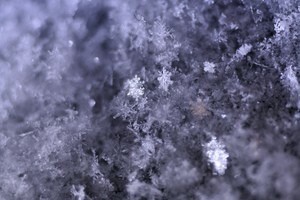 However, what might be his most well-known finding is that each snow flake is unique. The largest snow flake ever recorded fell in Fort Keogh, Montana in 1887 — that snowflake was 15 inches wide! Snirt is what you have when dirt and snow combine. The definition of a snowstorm is a snow event that lasts at least 3 hours, contains winds of at least 35 miles-per-hour, and reduces the visibility to less than 1/4 mile.